It was a simple overnight train ride down to Melbourne from Sydney. But now it’s a matter of getting the food and supplies organized for the hike this weekend in the Wilsons Prom Wilderness as soon as Carl finishes work. The past day or so in Sydney was adventurous in its own way. I managed to get up to Australian Geographic and visit the great crew of folks running the show up there, and the night before that (as mentioned in the previous post) I had an adventure getting to the Bush Firefighters meeting of the crew I was a member of while living out here. I met a young Canadian traveler and convinced her to join me on this crazy quest of getting to the remote fire station. After the hike this weekend, I’ll be off to the far west: Perth. 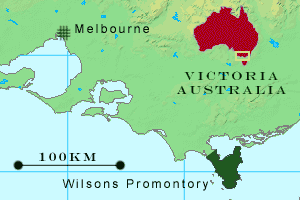 Of my year living in Australia, I never made it to Western Australia, which nearly covers a third of the continent! How could I miss it? ?